One convenient way to organize your recipes is by placing them in one or more binders, depending on your method of organization. This is a guide about use a binder to organize recipes. I have made a "recipe notebook" out of a 3-ring binder and clear insert pages to hold all my recipes that were loose in my kitchen drawer. I have also written down my recipes "from memory", that I know how to make, but never bothered to write down. This way my girls will have all of Mom's recipes when I'm gone. I've started to organize my recipes together as meals. I know that I always serve my Mexican rice recipe with my black bean casserole so now I keep them printed out on one sheet and then stored in my 3 ring binder. I always serve apple crisp with my Cracker Barrel casserole. So I have apple crisp with my desserts for the times I just want to make it alone, but then also as a dinner menu with the other so I always know where it is. I try to plan dinners in advance by choosing recipes and listing needed ingredients on a shopping list. The shopping list is always written on a sticky note and attached to a first insert (card stock) of my mini binder (7" x 4.5") which is always with me in my purse. I attach the sticky note to a handle of a shopping cart at a grocery store. 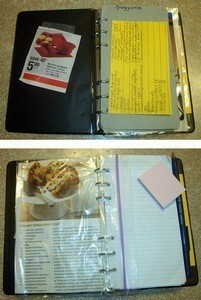 I put the recipes I am shopping for in the same binder in Ziploc sandwich bags. The recipes stay in the binder until I have time to prepare them. The protector gives some durability to the magazine clippings and also protects them from the kitchen grease when I am actually cooking (I attach the Ziploc bag with a recipe to my refrigerator with a magnet). I have a bookcase in my dining room filled with cookbooks that I have bought over the years. It is difficult, however, to remember which cookbook my favorite recipes are in. So I created my own cookbook with all my favorites. My three daughters were always asking me to share some of my favorite recipes, so I surprised them one Christmas by printing some of my favorites on acid-free paper, and putting them in small 3-ring binders that contained plastic sheet protectors. 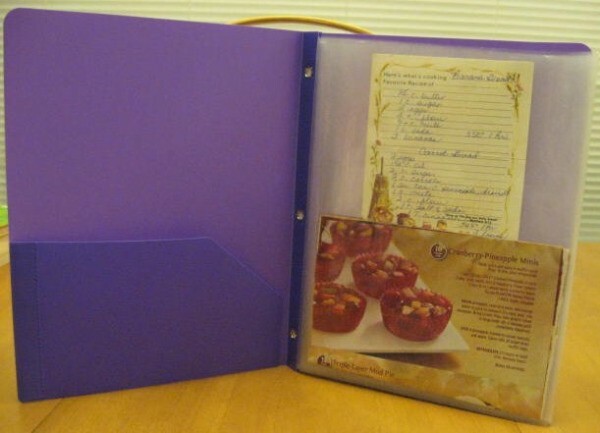 To keep my recipes clean, I place them in a plastic sheet and organize them in a large three ring binder. 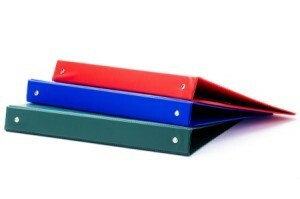 When I use one, I take it out of the binder. When finished, I wipe up any spills then return it to its place in the binder. I like to print out recipes I find online and I figured out a good way to organize and store them. I print them out so they take up a full page and then three hole punch them. I have two thick 3-ring binders, divided with tabs to make sections.